Seeing is not believing … the allegedly fake Brett Whiteley painting at the centre of a court battle involving Melbourne art dealer Anita Archer. AN ART dealer at the centre of a court case about an alleged fake Brett Whiteley painting faced bankruptcy, was suffering from depression, and ''had her head in the sand'' about her own defence, the NSW Supreme court heard yesterday. 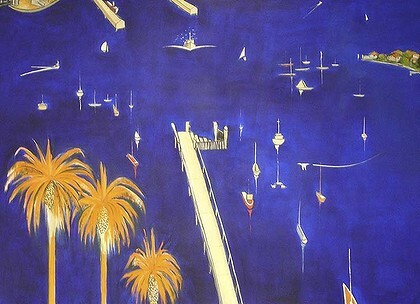 Melbourne dealer Anita Archer is being sued by Sydney banker Andrew Pridham for selling him a painting referred to as Lavender Bay, signed and dated ''Brett Whiteley 1988'', for $2.5 million, and for allegedly failing to exercise all the ''reasonable care, diligence and skill'' required to verify the painting's provenance. If she loses the case, ''it's curtains'' for her, her barrister, Simon Pitt, told the court yesterday. The disputed artwork is part of a much wider story that includes three alleged fake Whiteley paintings. Some of the biggest names in the Australian art world, including two auction houses, several art dealers and a number of wealthy businessmen, have become embroiled in disputes about the paintings. Mr Pitt said Ms Archer, who runs a fine art advisory business, had been dealt a very serious blow to her reputation ''and, rightly or wrongly, she has found it very difficult to cope''. He said she did not receive the full $2.5 million purchase price for the painting but only $300,000 as commission and yet was being sued for the full amount. In a statement to the court, Ms Archer denied having an advisory contract with Pridham ''or alternatively, [denies] that the terms of the advisory contract are those terms alleged by the plaintiff''. Mr Pitt told the court yesterday that Ms Archer relied on statements made by another Melbourne dealer, Peter Gant, from whom she allegedly bought the painting for $2.2 million, and Village Roadshow director Robert Le Tet, about the painting's provenance. Counsel for Mr Pridham, Geoffrey Watson, SC, opposed the defence's application for an adjournment, saying, among other things, there was no point delaying the case because Ms Archer could not win. An expert witness will be called to prove the painting is a forgery. Mr Pridham would destroy the painting after the case was over to ''stop it leaking back into the Australian art market'', Mr Watson said. Justice Garling said Mr Pridham's case in its present form was ''strong'' but he was not persuaded there was no room for Ms Archer's case. The matter was adjourned until August 10. The elements of style which she derives from Braque and Matisse, especially, are clear. On the other artists who have inspired her, she said in: "I really float from influence to influence. I found the early Ben Nicholson's fascinating as were the paintings of his wife Winifred", adding, "I also admire the Scottish artist Anne Redpath and the French painter Henri Hayden." Fedden was born in Bristol in 1915. The passion for art came to her early and was encouraged by her uncle, the painter Arthur Romilly Fedden. "I loved drawing when I was very small. I always did", she said. She left Badminton School, aged 16, to study art at the Slade. From 1932 to 1936 she learnt under Vladimir Polunin, the Russian artist known particularly for his creations with Diagalev for the Russian Ballet. Prompted no doubt by Polunin, she soon became involved as a stage painter in creating sets for the Sadlers Wells Theatre and for the Arts Theatre in the West End, while also producing wartime propaganda murals. Towards the end of the war she saw service for two years as a driver for the Naafi, travelling in France, the Netherlands and Belgium. Her first solo exhibition was of a group of flower paintings, shown in the Mansard Gallery at Heal's Department Store in 1947. After selling one these to the editor of Woman, she obtained a three-year commission to do covers for the magazine. She recalled: "I did these paintings quite quickly, sort of eight times a year, and in between, I could get on with my own painting, and started selling fairly well." Fedden had first met her fellow artist Julian Trevelyan while a student at the Slade and had become acquainted with him and his then wife, Ursula Darwin. When Darwin left him in 1949, Fedden suggested that he might like to take a road trip to Sicily with her. They made the journey as friends and came back as lovers. On their return she moved in to Trevelyan's Chiswick home and studio by the Thames, and they married two years later. Their house on Durham Wharf became a hub of creativity, with friends and neighbours including the artists Ceri Richards and Victor Pasmore and the film-maker Len Lye. Trevelyan had been part of the surrealist movement in the mid-1930s but had quit the group after just two years, preferring to remain independent. His creative drive and positivity towards painting and etching had a tremendous effect on Fedden's output at this time, while the subjects of her work were always her own. "Each of my paintings is a mixture of things that I'm looking at, and my thoughts and imagination", she commented. In 1958 Fedden started teaching at the Royal College, as the first female tutor in its Painting School. It was here she taught painting to David Hockney, while Trevelyan taught him etching, as one of the students during a period she called the "years of a very brilliant generation". When her husband contracted a serious viral infection five years later, she decided to stop the formal teaching. Fedden's work was not limited to canvas or paper. She completed a mural commission for children's television programme during the Festival of Britain (1951), for which Trevelyan also created his painting Blast Furnaces. A further mural by Fedden, for the P&O liner Canberra, followed in 1961. The couple travelled extensively to France, Italy, and Greece and to Malta, where Pasmore had a holiday home, and derived much inspiration from their shared voyages. Although Trevelyan's work was better known in the 1960s and '70s, her commitment to her own art means that it is her paintings that are now more widely recognised. She was elected a member of the Royal Academy in 1992 and served as president of the Royal West of England Academy (RWA) during 1984-1988. In 1996 the University of Bath gave her an honorary doctorate in recognition of her contribution to British art. An OBE followed a year later. Her most significant retrospective exhibition to date was in 2008 at the Portland Gallery in London, showing 125 works. Fedden has been the subject of two biographies. In Mary Fedden (1995), Mel Gooding says: "Fedden's painting reflects her personality in its capacious love for the objects of its attention". In Mary Fedden: Enigma and Variations (2007), Christopher Andreae observed: "She paints with unstinting disregard for the tastes and opinions of others and paints fast and often. She paints 'through the bad times' and paints on because continuing to paint is what she chooses and loves to do, and it is what drives her. Stopping is just not part of the plan." Mary Fedden, artist: born Bristol, 14 August 1915; OBE 1997; married 1951, Julian Trevelyan (died 1988, one stepson); died Chiswick, London 22 June 2012. 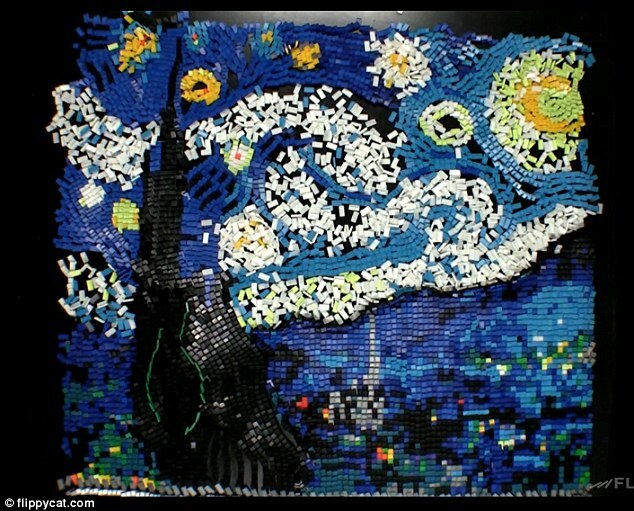 An artist with astounding patience - and a very steady hand - has recreated Vincent Van Gogh's painting Starry Night using 7,000 dominoes. The artist, who goes by the name of FlippyCat, spent 11 hours building the delicate structure - the second time he attempted it. The first design failed after a small screw was dropped into the scene and caused the dominoes to fall unevenly. The video of the project, which was uploaded to YouTube at the weekend, uses time-lapse photography to show just how painstaking the creative process is. 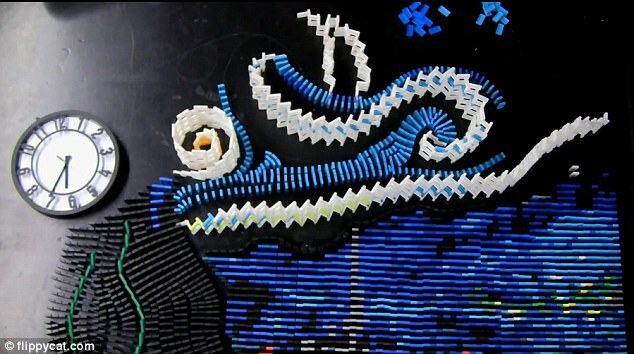 The artist used a marked-out drawing of Van Gogh's painting with a small ruler along with a larger ruler to line up each row of colored bricks. 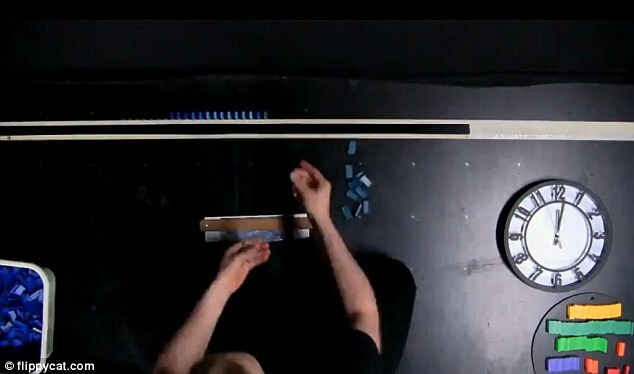 Each domino must be precisely placed so that it connects with the next when it is set in motion. It requires some of the bricks to be piled in towers so that they fall neatly into the exact design of the Van Gogh masterpiece. The first attempt failed because some of the sections of dominoes were placed too far apart and other fell unevenly, ruining the effect. The second attempt was on the whole successful with only one tower of bricks refusing to fall - a problem that was solved with a domino sent sailing through the air. The video of FlippyCat's achievement has already been watched by more than 170,00 people. In 2007, the artist created a domino version of the Mona Lisa using 4,519 colored bricks. Once again in time-lapse you can see the mistakes while perfecting his artwork. It has been viewed more than two million times on YouTube. 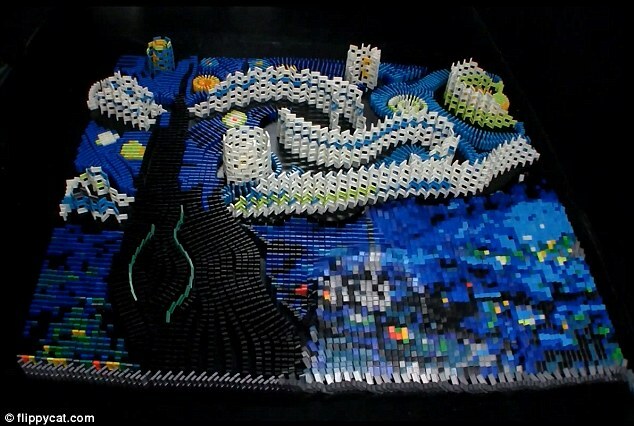 In another visually stunning spectacle, he also lined up 60,000 dominoes - a feat that took more than 65 hours to complete. He has also used dominoes to create the Google Chrome symbol, bowling pins, peace sign, eggs in a basket and a clover field for St Patrick's Day. Dutch artist Vincent Van Gogh painted The Starry Night in 1889. He created the oil on canvas from memory, depicting the view outside his bedroom window at the sanitorium he was committed to in the South of France. The painting, often considered the artist's finest work, hangs in the Museum of Modern Art in New York City.